The ‘Mobile Pill Box’ was the brainchild of W. W. Melvaine. He lived in Brighton Boulevard, Bondi, Australia. It was one of many inventions submitted to the Army Inventions Directorate of the Australian Army in the Second World War. 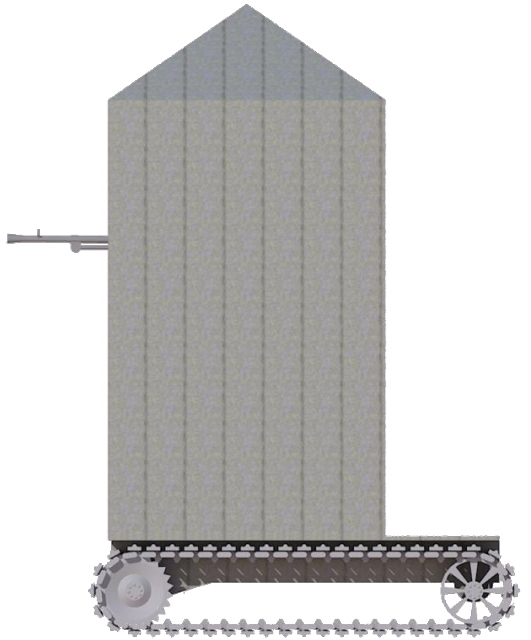 Many designs were submitted for all manner, shape, and size of weaponry including tanks. Although the inventors of such vehicles often had a preference for huge landships or ‘big-wheel’ designs there were also a number of smaller designs and Melvaine’s Mobile Pill Box’ is perhaps one of the more unusual Australian tank designs of the War. 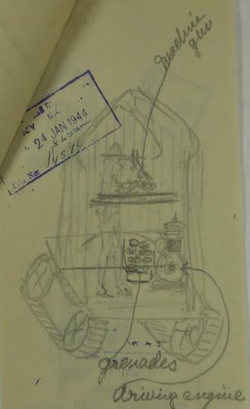 The sentence was followed by three crudely drawn sketches of his idea which more resembled the traditional Australian thunderbox (outside toilet) than any kind of useful tank. 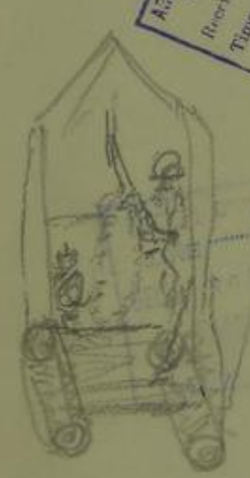 The design was relatively simple, consisting of a small tracked platform with at least two wheels on each side powered by a small motor in the crew space. This small motor was open to the occupant. There was just enough room for a single soldier. This soldier would have to man the single forward facing machine gun from a standing position. As well as the machine gun the soldier inside would have a box of grenades. 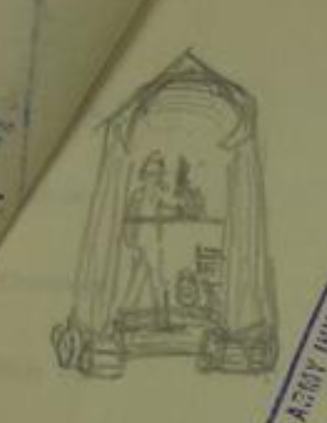 From within this armoured-outhouse, he would most likely have had to exit through the open rear to lob a grenade. This would have meant being exposed to enemy fire from the flanks. The height of the machine would mean it would be visible to the enemy before the soldier could see them and there is no clear indication of how it was to be steered or even how the soldier would be able to see where he was going. There is no indication provided by Melvaine as to the prospective size of the machine which can only be estimated by the size of the soldier and no idea as to the performance he wanted or expected. Likewise other than saying ‘bulletproof’, there was no thought given to the amount of armour this design should carry. Illustration of Melvaine’s Mobile Pill Box by Mr. C. Ryan, funded by our Patreon Campaign. “Tanks are in use for this purpose. The proposal is crude and retrograde”. And with that, the idea was dead. Being disparaging about some of these invention ideas could be considered churlish. This design had, after all, the advantage of simplicity on its side, and perhaps under other circumstances might have found some kind of use. The idea though, that in 1944, this invention might somehow be suited to attacking enemy positions when tanks were available was simply incorrect and betrays a fundamental misunderstanding on the part of the author. The rather short letter, more of a note about it, perhaps indicates that this was more of a whim than any properly considered design. Nonetheless, the idea was recorded and preserved even though the concept was completely disregarded. Nah, just having fun through the patents. 3 superb articles will follow, you’ll love them! What kind of articles are we talking about? Yes, it’s a little too silly for my taste. I liked it. It gives an example of the well-meaning (or charlatan) ideas that people bombard there governments with during war time. Could you imagine being on the committee that would have to wade through all the crackpot ideas, just on the chance there was a good one? Thanks for the information. I never knew about the Owen etc! Bob Semple having a run for his money I see. So forget that this just wouldn’t work from a technical, tactical, common sense etc etc., how much concrete would be needed? If this was used against, say a Japanese pillbox, how thick would the concrete have to be to stop fire from a machinegun? Was this produced before or after the public house closed for the night? As far as civilian input goes, you can’t ignore it for the one inspired notion, but you have to wade through an awful lot of garbage. During the Kaiser War, the British Master General of the Ordnance had to set up a committee to review the public’s submissions after the Patent Office requested the services of an “expert artillerist” to deal with the mountain of ideas they did not have the expertise to evaluate. After the Zeppelin raids started AA shells were particularly popular and Ian Hogg (The Guns: 1914-1918) said that if you plowed through the Ordnance records of the time one came to the conclusion that every man, woman and child in the British Isles “had a go” at designing an AA projectile. The most favored designs seemed to have favored some form of flick out knives or weights on the ends of chains or, better yet, knives on the end of chains. The only drawback is they all required a direct it (or nearly so) and given the airframe construction of the time, if you could manage that, a common house brick would have sufficed to bring down the target without any need for all the complication. And instead of concrete, I would have used the Plastic Protective Plating developed by the Royal Navy’s Department of Miscellaneous Weapons Development (Gerald Pawle’s The Secret War & Azriel Lorber’s Misguided Weapons). At DMWD’s offices a sample of PPP was used as a bulletin board, as it would easily take a thumb tack but stop an armor piercing bullet! Over 10,000 vessels (mainly merchantmen but including costal forces such as MTB’s and MGB’s and landing craft) received the plating and it was produced world-wide , including in the US.